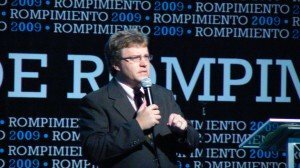 This got me to thinking about how do we do personal evangelism in the 21st century as I prepared my talk for a church leadership congress in Panama in September of 2009.
no money – only make $300-$500 a month. no interest — I want to go to the beach. Has people feeling privately depressed because conversions aren’t happening, so they give up. The people don’t have enough training. People don’t like talking to strangers! As I’ve talked with pastors and leaders in many of your churches, I also hear a high number of conversions that don’t stick with your church. People come forward every Sunday morning, but rarely do they come back for a second week. They might come back 1 or 2 Sundays, but not stay. Maybe 6 weeks and then gone. A relative mistreated by the church years ago. Don’t like the pastor’s sense of personal authority. Don’t wish to add 3 services a week plus bible study to their life. You know that what worked before isn’t working, so instead of trying to fix what is broken, let’s look forward at some new ways. Church based (as I see it here in your country). Salvation invitations at the end of preaching. Service projects to meet social needs. It’s something the women do on Saturdays and the preacher does on Sunday. It’s the big event with the imported expositor with miracles flowing from his or her hands. It’s the large stadium packed with people and pastors hoping their sheep won’t get stolen. Sharing faith 1-1 with strangers or friends and seeing results. Helping new believers get connected to a local church. Today, we’ll focus on personal evangelism in the 21st century. something that is not an appointment on Saturday? As abundant as the woman who poured perfume on the feet of Jesus? What can we do to help followers become fishers in the 21st century? What is the definition of personal Evangelism? obedient service to the world. I like this definition of evangelism because it shows us a method, a message, and the impact. Joyfully sharing – Followers are Fishers. Joyful – personal experience of transformation. God has touched your heart. God works in your life. You’ve got a story to tell. Sharing – comes in many forms. 1-1 relationship – give and take of conversation. Proclamation – preacher on a Sunday morning. It’s the spoken word and visible action. Current Stories of God’s work in your life. Stories of why you became a Christian. The good news of the sovereign love of God. You can live a life of victory – the resurrection has promised it. Good news can appeal in many ways – spiritual thirst. I Love to start with God’s promises, not our problem (separation) – when people want what God has for them, then we can deal the problem that blocks our way of getting it. A committed follower – obedient service in the world. The most effective form from the human side of the equation is relational evangelism. talking and showing the love of Jesus. Time of listen for a spiritual thirst and match the gospel to it. This will help solve your problem that I see with new believers not sticking to your church. More likely to get people connected to a church where they have friends. A little harder for a person to leave a church if their friendship base is there. Friends will notice when someone is missing and will know how to care for one another. Personal Evangelism training in cooperation with the Holy Spirit. Ongoing Evangelism training on practical steps to talk about your faith. 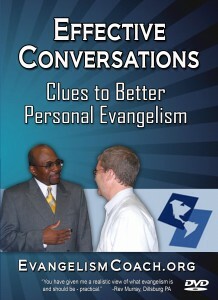 Read more about the Effective Evangelism Conversations for the 21st Century.